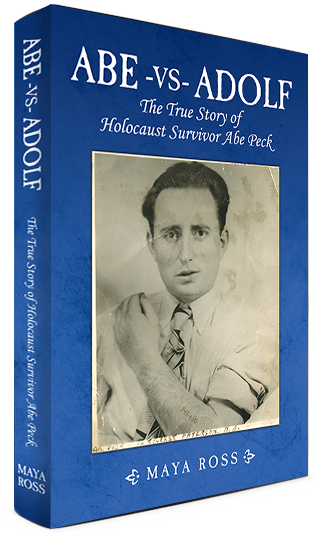 ABE-VS-ADOLF is the real life story of Holocaust survivor Abe Peck who repeatedly cheated death at the hands of the Nazis. As only a teenager, Abe was starved, shot, tortured and imprisoned for 5 years, in 9 different camps. Print book (Paperback) – 298 pages, including over 160 pictures to help illustrate Abe’s amazing tale. Special features: 25 Things You May Not Know About The Holocaust and Glossary of Foreign Terms. Ebook – For most eBook readers and devices. Video Book – For Apple products. Available in the iBooks Store. Special Features: 33 short videos which correspond to each book chapter; Three Generation Interviews With Abe, his son and grandson; 70th Anniversary Commemorative Tour of Auschwitz Today. Bring Abe’s story alive, making it more interesting, real, and memorable. The video book is an invaluable tool to engage readers and viewers for generations, long after survivors are gone. There can never be enough stories about the Holocaust, and Abe’s is a powerful one that should be seen and heard by all. Survivors of the Holocaust are nearing extinction. Even though they still live among us, there are many people who deny the Holocaust occurred. With the perilous state of the Middle East and antisemitism rampant worldwide, it is more important than ever to educate future generations to the horrors of persecuting a targeted group. Abe Peck’s incredible tale is captured in Abe-vs-Adolf, which combines dozens of authentic photographs with WWII European history to provide a one-stop Holocaust education. 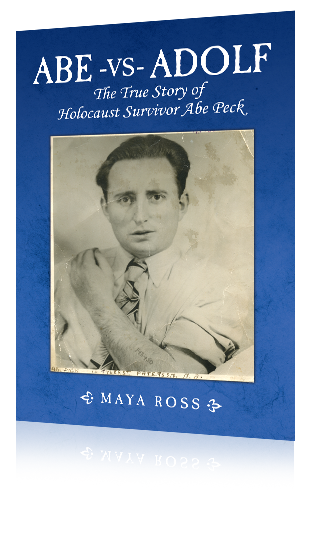 If you’re only going to read one book on the Holocaust, make it this one! And if you want to hear Abe, himself, tell his unbelievable story, there’s no substitute for the video book edition! If you have questions or comments please use the form below.